Sponges are an absorbing topic. If we were to define Porifera cladistically (e.g. as Porifera = Calcarea + Hexactinellida), then essentially all animals would be poriferans. That's because the Porifera, as usually conceived, are not a "natural group." They do not include all of the descendants of a single organism. Instead, they probably include only the basal members of an early radiation of the animals. This radiation included our own ancestors. Thus, any cladistic definition of Porifera which captures all of the organisms we usually think of as sponge-like, must also include all of their descendants, including ourselves. For this reason, we tend to use the informal term "sponge" to refer to things which are morphologically sponge-like, rather than the Latinate "Porifera," which implies a clade. We have always detested the phrase "grade of organization," since many crimes of sloppy thinking have been committed in its name. However, it is a fitting description of the sponges. The sponges represent a series of designs for assembling animal bodies by sticking gelatinous balls of cells together. It's a bit like making a whale out of jelly doughnuts. The individual units are squishy, fragile, and will either dissolve or make a horrible mess, unless they are supported and packed together in just the right way. Even then, we don't really recommend it. The individual, component doughnuts are not too different from choanoflagellate colonies. As the image below) from Thomson (1922) suggests, the individual choanocytes in the colonial choanoflagellate Proterospongia are embedded in a gelatinous matrix. Each of the cells resembles a microscopic martini glass, except that, rather than having a glass stem, it is supported by a (comparatively) immense olive with inserted toothpick. The toothpick is, of course, a flagellum. This flagellum is shaken (not stirred) to circulate the surrounding water from which the cells filter bacteria and more-or-less edible detritus -- microscopic, but otherwise indistinguishable from the Vienna sausages and soggy canapés one usually gets with a martini glass. This is the functional unit found in sponges . There are over 8000 extant sponge species. If you insist on knowing exactly how many, you must consult theWorld Porifera Database. All sponges are benthic, sessile, suspension-feeders which inhabited a wide variety of marine and fresh water environments. The sponges probably evolved by the Ediacaran, and fossil sponges are known from the latest Ediacaran or Terreneuvian. In fact, they have left a rather extensive fossil record, consisting largely of spicules. The spicules are secreted by sclerocytes and are needle-like structures composed of calcium carbonate or opalline silica. After death, these spicules are scattered across the sea floor and may be found as disarticulated microfossils. Sponges also manufacture structural organic fibers, primarily a collagen protein called spongin. The series of essays which eventually formed this Porifera section discuss the phylogenetic arrangement of the sponges at length, if not in detail. If you want to skip directly to the bottom line, the whole business is summarized in the introduction to the sponge cladogram at the end of this unit. 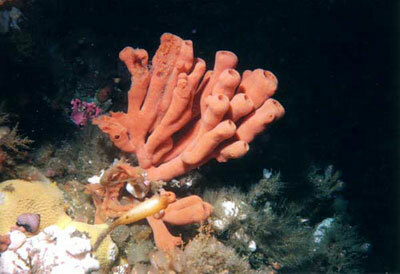 Image: Isodictya (= Esperiopsis) rigida (Orange Finger Sponge). This specimen from Waadah Island Fingers, Strait of Juan de Fuca Size: 30 cm tall. Demospongiae: Image copyright © Keith Clements and Jon Gross Marine Life of the Northeast Pacific. Pedantic Note: I. rigida was originally described by Lawrence Lambe, who is perhaps better known for his description of the tyrannosaurid Gorgosaurus. Sponges tissues are organized around a system of canals and chambers which ultimately connect to the outside world through multiple pores. 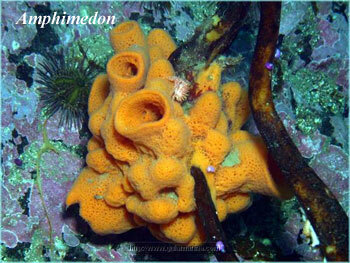 Sponge have two types distinctive of tissues: pinacoderm and choanoderm. The gelatinous region between them is the mesohyl. Pinacoderm. Think of the pinacoderm as an ectoderm analogue. The pinacoderm is a relatively inert wall of pinacocytes and collagen made by the pinacocytes). However, the wall is pierced by countless small pores. Pores may be constructed in several ways. Often, they are formed by single porocytes, doughnut-shaped cells which enclose a channel called a prospyle. Choanoderm.The pores lead to regions covered with choanoderm. As you might guess, choanoderm is an endoderm analogue which is contains the choanocytes. Choanocytes ingest food particles, as discussed above. The particles are packaged into food vacuoles and handed off to other cells. Mesohyl. The mesohyl is not a cell layer, but a soupy liquid layer containing a few points of interest. Herein lie the spicules and the sclerocytes which make them. If the sponge has protein (e.g., spongin) supporting elements, this is where you will find them. Here also are the amoebocytes, undifferentiated cells capable of becoming whatever other sort of cell is needed, included gametes. Solemn Asconoid Rite. At this point, a poriferan tradition, unbroken for almost two centuries, demands that we perform the Solemn Asconoid Rite. The purpose of this ceremony is to initiate you, the reader, into the Mystery of the Three Basic Sponge Body Plans. To our embarrassment, we have discovered that we cannot manage this with a straight face. The whole system is full of needless terminology, unjustified assumptions about phylogeny, and obsessive line-drawing. Here's the essence. Sponges generally have at least one large internal space (spongocoel or atrium), one end of which is open to the environment. This opening functions as the main water exit (osculum). The incurrent pores of the pinacoderm may open directly into the spongocoel, or into canals which eventually lead to the spongocoel. If canals are present, the canals may or may not include internal chambers. Clearly, choanoderm must form the lining of (a) the spongocoel, (b) the canals, c) the chambers, or (d) some combination. That's about all there is to it. Sponge Physics. Sponge physics holds more interest. The sponge has no way of actually pumping water. All it has is a bunch of tiny flagella acting like miniscule oars. Each flagellum can only exert a tiny pressure increment on the water stream. Sponges can produce a great many flagella, but only at the expense of adding surface area. That's a good thing for feeding, but rapidly becomes a losing proposition, since narrow or convoluted channels quickly add friction and turbulence, creating back-pressure. Fortunately, sponges, in addition to flagella, also have a much better handle on Bernoulli's principle than we did in high school. One useful corollary of Bernoulli's principle is that, to a first approximation, water velocity is inversely proportional to the cross-sectional area of the flow. (1) the cross-sectional area of any given pore is considerably smaller than the channel, chamber or spongocoel it opens into. Consequently, water slows down and flows smoothly over the feeding surface. However (2) the cross-sectional area of the osculum is smaller than the combined areas of all of the pores, so that exit velocity is high enough to remove wastewater from the immediate vicinity of the sponge. In this way, water which has been depleted of food particles is ejected away from the sponge. Sperling et al. (2006) (citing Brusca & Brusca, 2002). The system is remarkably efficient. Sperling et al. point out that, "a large sponge can filter its own volume of water every 10 to 20 seconds (Brusca & Brusca 2002). In situ feeding studies on modern sponges demonstrate that some derive the majority of their food from DOC [dissolved organic carbon], and can remove an average of 10% of the DOC in the water in a single pass through the water canal system (Yahel et al. 2003)." Internal Skeleton. As mentioned, the body of the sponge is usually reinforced with spicules made of silicate or calcium carbonate. A few basal demosponges make no spicules. 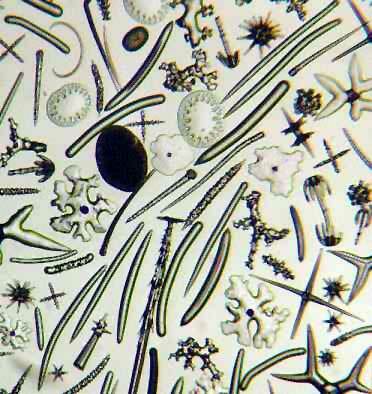 Typically, a sponge makes spicules in a small variety of shapes, with characteristic hooks and processes. A common spicule repertoire includes small, stellate spicules (microscleres) combined with large, elongate spicules (megascleres). Additional structural support is provided by a collagen homologues, particularly (in demosponges) spongin. Most sponges make silicate spicules, but the Calcarea make spicules out of calcium carbonate. A few, both extinct and extant, appear to make both sorts, or make spicules from protein only. Bavestrello et al. (1998); Botting & Butterfield (2005). Both hexactinellids and demosponges make spicules in about the same way, using the same enzymes. Müller et al. 2007). One of those enzymes is silicase, which is almost identical to a form of carbonic anhydrase. The other is silicatein. The spicule primordium is produced in a cell vacuole. When the spicule primordium is extruded from the cell the silicatein binds to the surface and also to another protein (a galectin) in the presence of calcium ions. After extrusion, the spicule undergoes further growth and "shaping" -- presumably involving more silicase, as well as the attached silicatein. Id. The point of all this is that the carbonic anhydrase activity of silicase will also produce carbonate from ambient CO2, while calcium ions must be present, all over the spicule surface, to bind the silicatein. Under those circumstances, it wouldn't take much to spark spontaneous growth of crystalline calcium carbonate over the scaffold of the original spicule. Thus, calcareous sponges with calcium carbonate spicules would be an almost inevitable evolutionary consequence of this mode of spicule development. Sponge Lectins. A fair amount of work has been done in the last few years on the biochemicals which hold sponges together. With the exception of homoscleromorphs discussed later) sponges do not have a basement membrane to hold their outer cell layers (the pinacoderm and choanoderm) together. The space in between the cell layers (mesohyl) is mostly water with a few cells and some dissolved protein. Then what holds the cell layers together? How do the cells know that they are embracing another friendly sponge cell, rather than some hostile bacterium, a parasite, or a loose cell belonging to some other sponge? The answer goes to the important distinction between (1) a genetically homogeneous animal and (2) a colony of cooperating eukaryotic protists. We will not get into the biochemistry of lectins and glyconectins, for which see, e.g., Müller 2003); Misevic et al. (2004). In essence, these are glycoproteins. With (lectins) or without (glyconectins) help from special binding proteins, they are capable of self-recognition with a specificity rivaling that of mammalian immune systems (Müller, 2003) and extraordinary binding strength (Misevic et al., 2004). Thus sponges are clearly individual organisms. Transcription Factors. From the vantage point of evo-devo, the Porifera also represent a key transitional step. Simionato et al. (2007) looked at essentially all of the metazoan genomes which have been completely sequenced, including the recently completed genome of the demosponge Amphimedon. From this data, they attempted to identify all of the genes coding for basic helix-loop-helix proteins. Basic helix-loop-helix (bHLH) proteins and homeodomain proteins are the two most important groups of transcription factors in bilaterians. Together, they control most of the higher level genetic switches in bilaterian development. Single-celled Eukarya have only 1-3 bHLH genes, and the proteins are used in metabolic regulation. Bilaterians and the anthozoan (sea anemone) Nematostella usually have about 60 (more in vertebrates) which fall into over 40 families, and are used mainly in transcriptional control of development. Amphimedon (and, to a lesser extent, the hydrozoan, Hydra) are thus far the only organisms to have an intermediate condition. In particular, the demosponge has only 16 bHLH genes, representing 10-14 families. All but a handful of Amphimedon's bHLH genes fall into families also known in bilaterians. Thus, a large part of the evolution of the bHLH system seems to have taken place within or close to the poriferan grade. Simionato et al. (2007). Contrast this with the hox system, which seems to have evolved in the cnidarian grade. page by M. Alan Kazlev (Creative Commons License) 1999-2002.